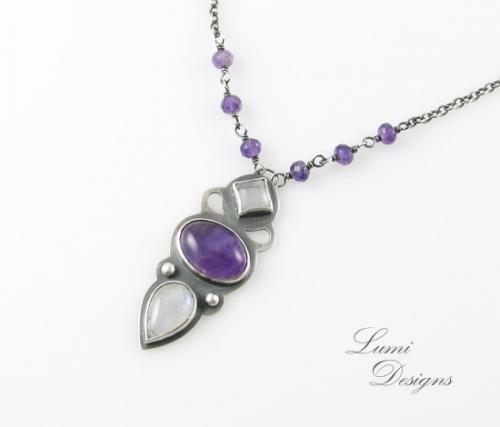 Necklace "When Thoughts are Silent"
Amethyst is a stone of spiritual protection, purification and transformation. It is used to get rid of bad habits since it has cleansing effect and it helps one find balance and restraint. Amethyst also aids travellers and therefore it is good to keep it in the car where it helps on reach the destination safely. Amethyst eliminates fear of changes and eases one’s view on the future. It is especially useful for those, who often express their emotions with anger and rage, because of its calming and balancing effect. It also relieves sadness and grief, and helps to cope with losses. Due to its cleansing effect, it is used to block geopathic stress.